Gulfstream Park continues to be the go-to horse racing track for significant stakes races. Last weekend the south Florida track hosted the Pegasus World Cup and the Kentucky Derby prep race, Holy Bull Stakes yesterday. Today, Gulfstream's card contains two of the day's three stakes races with more than $100,000 in prize money. The other is at Aqueduct. In New York, New York, 11 three-year-old fillies will race 1 1/8th-miles on Aqueduct's main track for the $100,000 BUSANDA STAKES. During the current meet, the distance typically favors early speed types with 11 of the 34 winners leading gate-to-wire. The inside three post-positions also provide an edge with 39% of the winners leaving from gates one through three. Unfortunately, none of the inside three horses has a history of 1s across their past performance lines. The two horses in the field that have shown a recent interest in running on the lead are FILLY JOEL (PP: 9 ML 2-1) and MISS MARILYN (PP: 11 ML 5-1). 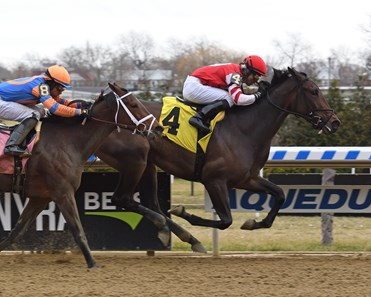 Despite their outside starting positions, our handicapper believes both have a shot to hit that early turn near or on the lead and set the pace all the way around Aqueduct's 1-mile oval. From our pro-subscribers' bonus commentary: "MISS MARILYN shaved more than three seconds off her final 1-mile dirt time in her last race compared to the previous race. That's a heck of a race-over-race improvement. FILLY JOEL may have raced above her head in a Grade II stakes race. The drop in class should help. GETTING WARMER trainer Edward Coletti, Jr. spots his horses well, winning at 27% with shippers. LADY BANBA finished second as the chalk in her last race. Trainer Robert Reid, Jr wins at 30% with beaten favorites the next time around the track." Eleven three-year-olds will be racing for the 100,000 DANIA BEACH STAKES in the ninth race at Gulfstream. They'll run 1-mile on the turf in a two-turn race. The surface/distance favors off the pace types with 55% of the 62 winners coming from behind. Again, post plays a big role as slots eight and out win disproportionately. Our handicapper believes it is a good spot for the 2-1 morning-line favorite, CUURENT, who draws the 10-spot. He's predominately an off the pace runner and looks well placed and positioned: "CURRENT failed in the slop in his last race, going back to grass should provide a big boost where he has two wins and a third in four races. A THREAD OF BLUE came off the bench, ran his best speed number and won. The same race should equal the same result. CASA CREED tried turf for the first time coming off a layoff on January 5th. He liked it, winning by a neck and running his second-best speed figure. He could be better in round two. LOUDER THAN BOMBS has fared well on GP grass with two wins and a third in five races." Nine, three-year-old fillies will also turn left twice at 1-mile on grass in Gulfstream's $100,000 SWEETEST CHANT STAKES. Although the same 1-mile post-position bias remains, it looks like the better horses are on the inside, according to our bonus commentary. "REGAL GLORY owns the highest, last race speed number and is two for two on turf. LE FEVE is making her first start for trainer Chard Brown, a 29% angle for the all-world trainer. HARD LEGACY has made easy work of it in her two starts, two wins, both on grass. A BIT SPECIAL is a horse for the GP grass course, winning three of four with a second."